Parents of children with ADHD know how hard it can be hard for their kids to stay on track at school. Australian author Ruth Divine knows the struggle more than most. All three of her kids have ADHD and this has prompted her to write a series of new books. Full details about the book series or buy online click here. 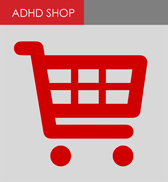 ADDults with ADHD has a range of publications for sale. There is also a library of books and DVDs available on loan to members. The articles on this website are for general information and interest only. ADDults with ADHD does not endorse any particular treatment, theory, service or organisation mentioned in the articles and recommends that individuals seek advice from health professionals for their specific situation.